The Flute Stand is made of quality metal material, sturdy, anti-rust, lightweight and durable with fine workmanship, which provides stable support for musical instrument, a great Christmas gift to your friend who love clarinet, flute. WITH SOFT PAD: The anti-slip and soft pad on the top can protect the inner surface of instrument from scratches and designed to store away when not in use and wear along. 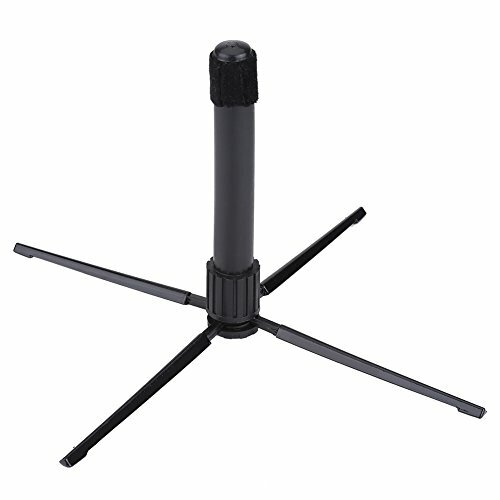 DURABLE: The metal flute stand is made of quality metal material, sturdy, anti-rust, lightweight and durable with fine workmanship. FOLDABLE: Folding and retracted design allow easily carrying and storage, a useful accessory for clarinet, flute, oboe. 4 FEET DESIGN: Four feet design provides stable support for musical instrument, a great Christmas gift to your friend who love clarinet, flute.